Allow me to introduce the chocolate custard muffin. Sometimes you see a recipe and just know you have to make it. This is one such recipe. The word ‘chocolate’ caught my attention, before the comforting ‘custard’ enveloped me in a blanket of nostalgia. To me a chocolate custard muffin suggests warmth and sweetness, flavour without pretension, richness without intensity and a big fat hug in food form. I had to make them. Could this be the best chocolate muffin you’ll ever eat? 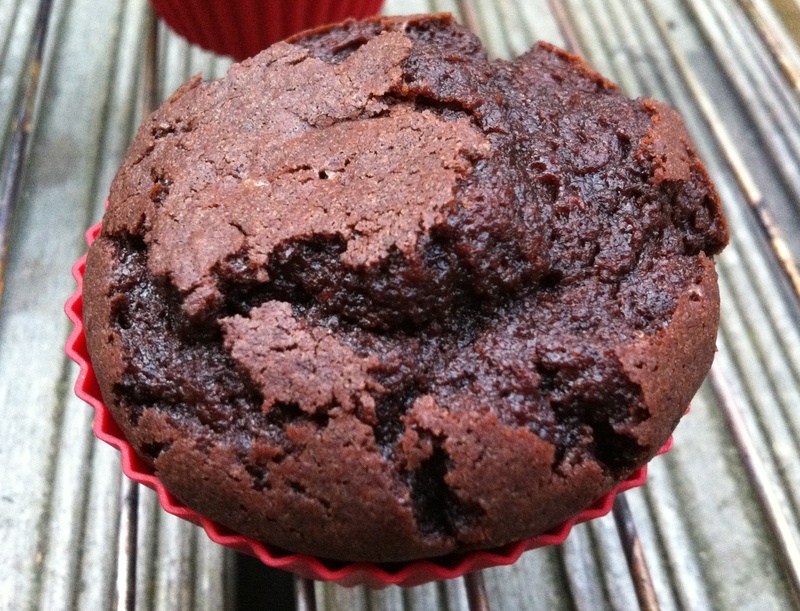 The result is a beautifully moist, luxuriously chocolaty muffin with a rich, rounded taste. The shiny cracked crust gives way to a crumbly middle run through with chocolate and vanilla flavours making it very moreish, with a relative lightness compared to its brownie or cookie counterparts. For my taste they could maybe benefit from a handful of chocolate chunks – I like the contrast of moist crumb and creamy chocolate – but perhaps that would go against the notion of a smooth custard muffin. Next time I’m going to experiment with flavours too – substituting a little rum, whisky or orange juice for some of the water would add a lovely sophisticated twist to this comfort blanket of a bake. There’s much debate as to where the boundaries lie between a muffin and a cupcake, with most people accepting three main differences; the method – a cupcake’s ingredients are creamed where a muffin is mixed all in together; the function – the lighter cupcake is more of a frivolous affair where the denser muffin can be enjoyed on all occasions (including breakfast! ); the presentation – cupcakes tend to be frosted whereas muffins wear their bumpy cracked crusts with pride, only occasionally spread with a slick of water icing. I’ve defied convention and topped my muffins with a swirl of squidgy marshmallow cream. I simply couldn’t resist, and anyone who has ever tasted a Tunnocks teacake, stuck a spoon of Phish Food in their mouth or scoffed down a S’more will understand why; chocolate and marshmallow is a match made in confection heaven. The appearance doesn’t quite have the ‘cloud of fluffy white cream atop a dark chocolate base’ look I’d been aiming for, with this workman laying blame squarely at the feet of her tools. Having forgotten to buy marshmallows on my weekly shop, I was at the mercy of our local corner shop which (of course) only stocked a pumpkin shaped (and coloured), Shrek branded variety. The resulting orange cream is a little sickly to look at, but I guess it fits with an autumnal/Halloween theme, and the contrast of chewy cream and crumbly cake still worked well, so I’m happy. The Halloween pumpkin marshmallow in all its ugly glory. . . The recipe below was first published in Dan Lepard’s Guardian column a few years back, and has recently been revived in his brilliant new baking book, Short and Sweet. I’ve halved the quantities as I only wanted to make a small quantity of muffins, but you can find the original recipe here. What’s the best recipe title you’ve ever read? Do you prefer muffins or cupcakes? 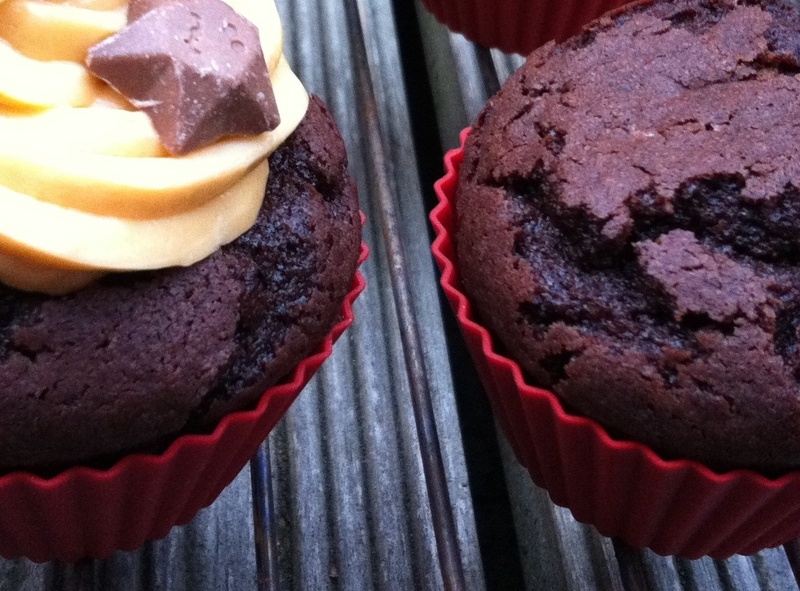 And if you could add one flavour to these chocolate muffins, what would it be? Measure the flour and baking powder into a bowl, stir together, then sift directly on to the custard and beat through until combined. Spoon into paper muffin cases sitting in the pockets of a muffin tray and bake for 25 minutes. Heat the marshmallows and milk in a saucepan over a low heat. When half melted, take off the heat and hand whisk until smooth. Leave to cool slightly. Beat the butter until creamy then gradually beat in the marshmallow mixture until whipped and smooth. 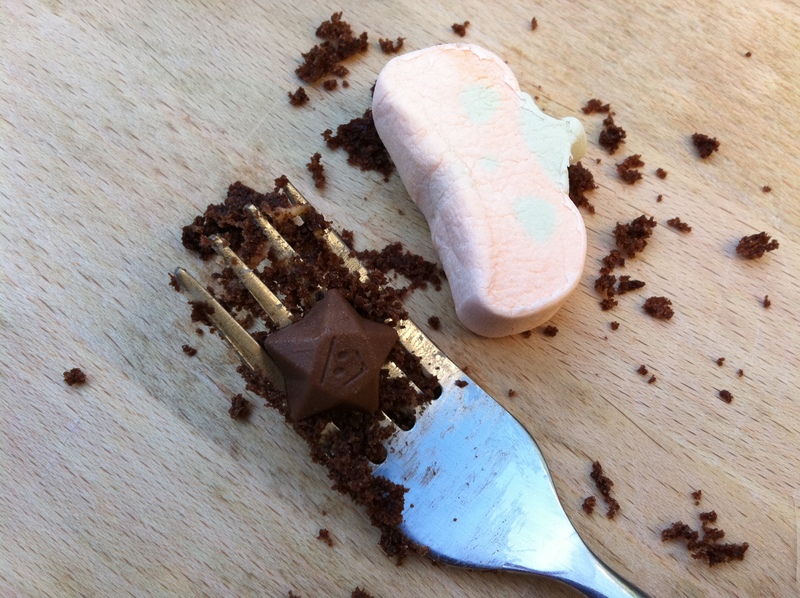 Transfer the cream to an icing bag with a star-shaped nozzle and pipe over your muffins. 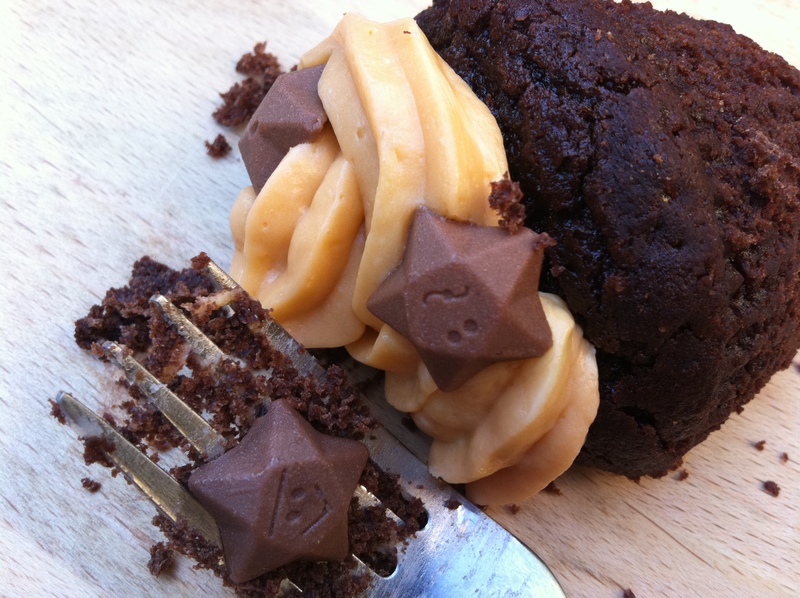 Decorate with mini chocolate stars, a drizzle of dulce de leche or melted chocolate and enjoy. These muffins would also be delicious with a spoon of natural yoghurt, warm with a scoop of cold ice cream or, for the ultimate indulgence, a puddle of warm (chocolate) custard. These sound absolutely delicious – I was intrigued when you mentioned them on twitter and they look even better than I could have imagined! Your shrek marshmallows made me laugh. Nice recipe. Yay for muffins! I hate being a victim of the ‘corner shop fail’ but at least they had some sort of marshmallow. – they look so chocolatey and tasty even with the orange tint. London Bakes – aw thank you, glad you like! Warm Snug Fat – ‘corner shop fail’ – love it! Muffins for me! Chocolate and Cognac or Whisky! This muffin look super moist. The way you described it makes me drool! Not Quite Nigella – exactly. Chocolate, custard, muffin – the holy trinity of pudding heaven! Chocolate custard muffins…where have they been all my life? It’s like pudding and custard in a handy-to-carry form! “flavour without pretension, richness without intensity” indeed indeed… This look sooo great! Mmmm chocolate custard muffins sound so delicious. I’m not sure of the best recipe title I’ve ever read, but any baking recipe that contains the words salted caramel immediately captures my attention. The Caked Crusader – when you put it like that…it’s the perfect portable pudding! The Moveable Feasts – muffins definitely have a comfort factor about them. They’re not as pretty as cupcakes, but they make up for it with extra character! Delicieux – 100% agree, anything with salted caramel gets my attention immediately. Yum. When I hear the word ‘custard’, I think of that hideous school dinner gloop: thick, yellow, viscous, with an unpleasant skin on top. I just can’t bring myself to ever make or eat anything involving custard. That said, I’ve made creme patisserie/ice cream base before and can eat that, largely because I know exactly what’s gone into it. So I might just be able to manage a batch of these muffins…! I was going to say, before I even read your first paragraph, that all I needed to know was the title of this recipe and I was hooked! They look and sound amazing! I wouldn’t say no to anything with chocolate custard in the title. Erin – as soon as I saw it in the book I new I had to make them! Working London Mummy – so pleased you like it. Marshmallow and chocolate is one of my favourite combinations, hot or cold. Julia – you can’t go wrong with chocolate and custard in my book! Is it weird to leave a comment in gibberish? If these were in front of me, that would be my first and only language. WOW…they are decadent and gorgeous!! littleloaf, i just discovered these muffins – they look scrumptious! i love a crust and a moist center. and marshmallows. Yup. The title got me! I don’t have cornflour… is there anything else I could substitute for it? Also, have you ever tried using whole wheat flour? where/how did you get the little star chocolates? those are amazingly cute!!! Oh Shine On – I think you could probably substitute a normal light flour – wholemeal would weigh them down a bit too much. Kurisu – they are Milky Way Magic Stars – available in most shops in the UK!